Suzanne answers questions from John Wilson and an audience about her platinum-selling album, Solitude Standing. From November 2012. 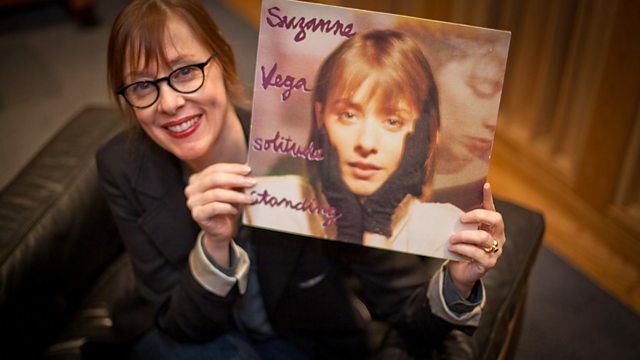 John Wilson talks to Suzanne Vega about her career defining album "Solitude Standing". Programme 2 (B-side).Now it's the turn of the audience to ask Suzanne the questions. We hear how the sound of Solitude Standing changed toughened from her previous album, as Suzanne decided to bring out the drums and give the sound an edge. Suzanne describes writing the song "Gypsy" for a boy she met at summer camp and how the two of them got back in touch when he realised the song was about him. And we hear how Suzanne has written a follow-up song to the album's hit song "Luka". Suzanne Vega talks to John Wilson and a live audience about her album Solitude Standing. Watch videos and read reviews of Suzanne Vega's recent albums on the BBC's Music pages.